I finished playing Disney’s A Christmas Carol for my literacy students yesterday, which means I saw it five times! So I figured I would review it for the Doc’s Classic Movies section here at EYG. The film is one of dozens of adaptations of Charles Dickens’ novel, this one a 3D computer animated motion-capture version from director Robert Zemeckis. This early version of mo-cap was somewhat awkward at times, but showed initially what was going to be possible. 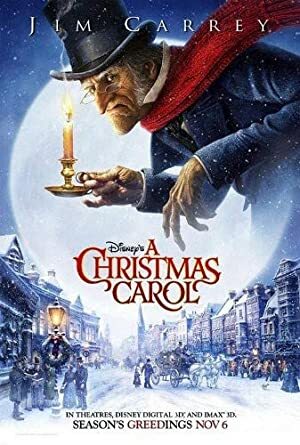 The classic tells the story of miser Ebenezer Scrooge (Jim Carrey) and how he was visited by a series of ghosts one Christmas Eve trying to scare him straight and get him to accept Christmas in his heart. Gary Oldman was here as Bob Cratchit, Jacob Marley and Tiny Tim. Colin Firth was Scrooge’s nephew Fred. Robin Wright played Scrooge’s little sister Fan and his former fiance Belle. Cary Elwes was here as well as a couple of the more minor characters. The voice cast was done well, but some of the motion capture made these people look pretty weird. The heads were oversized and their expressions were odd many times. Still, it provided animators an opportunity to push the boundaries of animation at a time when this was just being started. The story was done well, however I was not a huge fan of the action section added to the future scenes where Scrooge is chased by a haunted horse pulled carriage and shrinks down to mouse size. This seemed like an excuse to add some action to a story that did not need action. A Christmas Carol is compelling enough without some kind of chase scene tossed in. The film is very dark and has some great spooky moments. I know that the kids were startled a couple of times at the imagery and the jump scares that were included. This version of A Christmas Carol provides an effective adaptation of the classic tale, including most of the iconic lines. Jim Carrey is wonderful in the lead role as the miserly Christmas hater. He stands out among all of the animated characters as well, being the one who has clearly had the most time committed to him. Carrey’s voice is perfect for Scrooge, and he also does the voice of the Ghost of Christmas Present. Bob Haskins as Fezziwig though was very odd. His character’s head was gigantic and the dance he had with his wife was weirdly gravity defying. In the end, this version does a good job of telling the story of Scrooge in an entertaining and engaging manner and it kept the attention of my students. I liked seeing it as well.